Asphalt has been a crucial material for construction and paving in Mesa, Arizona and the Sonoran desert as early as the 13th century. Asphalt makes up our roads, alleys, parking lot surfacing, driveways, and freeways. It provides a smooth surface for our vehicles to drive on and a safeway surface for pedestrians to walk on. But what exactly is asphalt? Why do we use it? Why is it important? How is Mesa working to make asphalt more green and eco-friendly? Asphalt, known also as bitumen, is a substance that is a form of petroleum. It is essentially a mixture of dark bituminous pitch and natural components such as sand, gravel, and stones. Asphalt is a highly viscous liquid, meaning it is extremely thick and resistant to tension. Asphalt is mostly manufactures and refines, but the substance can occur naturally in nature. Chunks of natural asphalt, or ‘crude bitumen’, have been found in the Dead Sea. What is asphalt used for? Asphalt is primarily used for paving roads. Because it is highly resistant to tension, it works well as a paving material under the weight of heavy vehicles and trucks and even airplanes. It can be mixed with other aggregate materials to create a stronger type of asphalt concrete. Asphalt can also be used for waterproofing products and roofing material. Asphalt has been used by people for thousands of years and is in no way a new concept. Archeologists have found processed asphalt used as adhesives in Indus valley sites dated as early as the fifth millennium BC. Asphalt has been used by Sumerian, Egyptian, Roman, East Asian, and Native American societies. It was used mostly as an adhesive for buildings but also as a waterproofing material for underwater tunnels and scabbards. It was also used as an art material for creating statues and for strengthening weapons. 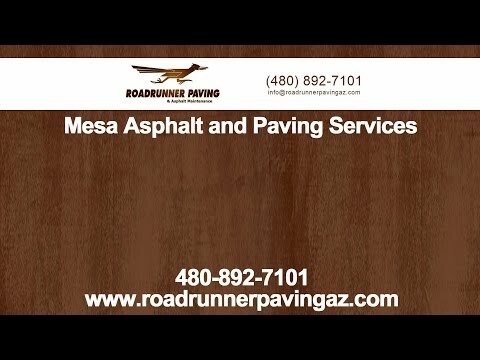 How is asphalt used in Mesa? Nearly 85% of the asphalt consumed by Mesa and the rest of the United States is used for asphalt paving of roads and surfaces. Mesa typically uses asphalt concrete for the paving of roads, alleys, parking lot surfacing, driveways, and airport runways. Mastic asphalt is typically used for repairing and manufacturing roofs for buildings. Asphalt shingles are used for some Mesa buildings, but the most popular roofing material is clay tile. How is Mesa changing the asphalt paving industry? Greenpatch is a type of asphalt created via patented Cold Mix Manufacturing (CMM) technology. Because asphalt has to be heated in order to be applied as pavement, fumes can affect our atmosphere and excessive power must be used to heat it. Asphalt is also a byproduct of petroleum, meaning it is composed mostly of nonrenewable resources. Greenpatch bridged a promising partnership with Arizona-based distributor and packager Paragon Concrete Products several years ago, giving the eco-friendly cold mix asphalt more publicity and a wider market presence in Mesa and the rest of the southwest. Asphalt seems pretty neat! I’m interested in using it for my next project. Can I do it myself? Who can I call? Trained paving contractors know exactly how to properly install your asphalt pavement. Not only is doing it yourself expensive, but the lack of expertise the average DIYer may have could lead to improperly applied asphalt that will lead to huge problems in the future. Roadrunner Paving & Asphalt Maintenance is a paving contractor in Mesa, you can believe in. Rest assured, the job will be done right by this talented crew of paving professionals. Roadrunner Paving & Asphalt Maintenance is family owned and operated and has been serving the Valley for over twenty years. Some paving contractors will do a cheap quick job and leave your asphalt driveway or parking lot looking good for a while, but soon serious problems such as cracking and blowout potholes will begin to show up. Roadrunner Paving & Asphalt Maintenance will install your asphalt driveway or parking lot properly and with care. When you eventually need your asphalt surface maintained or touched up for preventative, corrective, or emergency repairs, Roadrunner Paving & Asphalt Maintenance will be there to get the job done. Roadrunner Paving & Asphalt Maintenance does both residential and commercial asphalt paving, so both your home and your business could be looking great. Give us a call today and we’ll get started.